Leishmaniasis, a neglected tropical disease, currently infects approximately 12 million people worldwide with 1 to 2 million new cases each year in predominantly underdeveloped countries. The treatment of the disease is severely underdeveloped due to the ability of the Leishmania pathogen to evade and abate immune responses. In an effort to develop anti-leishmaniasis vaccines and adjuvants, novel carbohydrate-based probes were made to study the mechanisms of immune modulation. In this study, a new bioerodible polyanhydride microparticle was designed and conjugated with a glycodendrimer molecular probe. This molecular probe incorporates a pathogen-like multivalent display of α-1,2-trimannose, for which a more efficient synthesis was designed, with a tethered fluorophore. Further attachment of the glycodendrimer to a biocompatible, surface eroding microparticle allows for targeted uptake and internalization of the pathogen-associated oligosaccharide by phagocytic immune cells. The α-1,2-trimannose-linked bioerodible microparticles were found to be safe after administration into the footpad of mice and demonstrated a similar response to α-1,2-trimannose-coated latex beads during L. major footpad infection. Furthermore, the bioerodible microparticles allowed for investigation of the role of pathogen-associated oligosaccharides for recognition by pathogen-recognition receptors during L. major-induced leishmaniasis. This article is published as Rintelmann, Chelsea L., Tara Grinnage-Pulley, Kathleen Ross, Daniel E.K. Kabotso, Angela Toepp, Anne Cowell, Christine Petersen, Balaji Narasimhan, and Nicola Pohl. 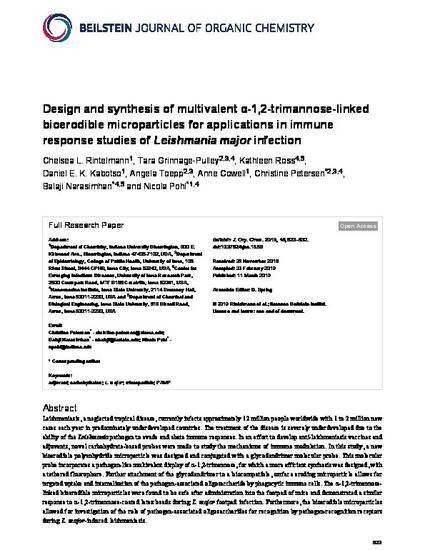 "Design and synthesis of multivalent α-1, 2-trimannose-linked bioerodible microparticles for applications in immune response studies of Leishmania major infection." Beilstein Journal of Organic Chemistry 15, no. 1 (2019): 623-632. DOI: 10.3762/bjoc.15.58. Posted with permission.